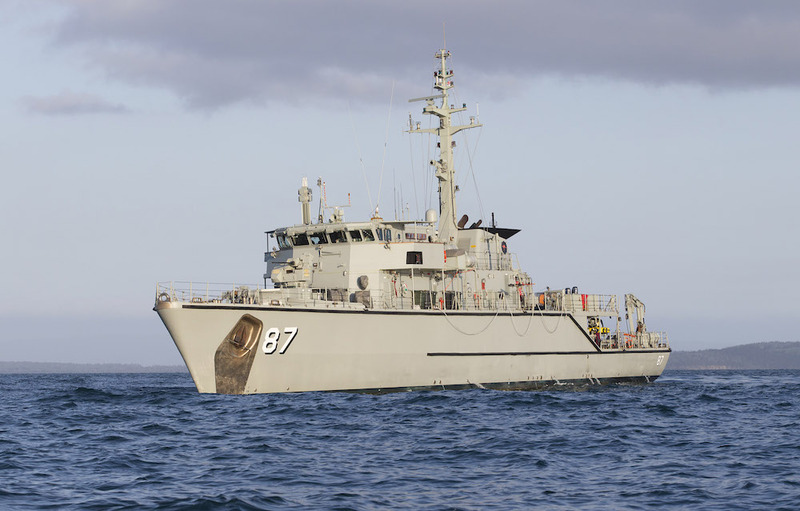 HMAS Yarra (IV), the sixth of six Huon Class minehunters built in Newcastle, Australia was commissioned on 1 March 2003. Like her sister ships, Yarra's unique hull design is shock resistant with a low magnetic and acoustic signature. This allows the ship to operate in hostile mine environments. When mine hunting, propulsion and precision manoeuvrability is achieved using retractable thrusters. The Ship uses variable depth sonar to search for and prosecute mines. Upon detection, the ship deploys the remotely operated Mine Disposal Vehicle (MDV) or clearance divers to identify and neutralise mines. The MDV, equipped with a searchlight, camera, sonar and disposal charge, is controlled from Ship's operations room.